I have been a lot of questions lately about kilns. I guess that's because I have a book coming out in 18 days!!!! I can't believe it. I think people are getting excited about trying their hand at ceramic bead making. 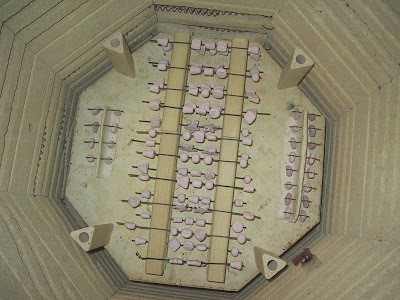 Above is a photo of one of my kilns loaded for a glaze firing. All of the beads have to be suspended on a high temperature wire or the glaze will stick to whatever it is touching. Yes, I know what you are thinking, it does take forever to load a glaze kiln. I thought I would talk a bit about kilns, and the types, so if you are in the market for one this might help. Kilns are basically really hot ovens. They are insulated really well to hold in heat and to keep you safe. Kilns for glass, ceramic, and metal clay are all built the same way. Sometimes you will find a glass kiln that has elements in the lid for more even heat distribution but all in all it's the same kind of kiln. The only difference is how hot the kiln will get. Ceramic clay is fired hotter than glass or metal clay. So if you already have a kiln you just need to look at it's highest temperature rating to see if it will work. Ceramic clay is fired at many different temperatures. There are many factors including which type of clay and glazes you are using. Low fire clays and glazes, which are still super strong, are fired at 1828 degrees F. To fire ceramic clay you will need to at least fire to this temperature. Some clays fire even hotter, like 2300 degrees F.
If you haven't bought a kiln yet, and you are wondering if you should buy a digital or a manual kiln here's the difference. Kilns that shut off with a cone, these are traditional ceramic kilns will usually just work with ceramics. I have a few of these kilns and you can fire metal clay and glass. I have done it. It just takes a lot of time to watch the kiln and really know whats going on inside. If you have a digital controller you can set what rate you want the kiln inside to climb to and walk away. The digital kiln will also hold a certain temperature. This is really important in glass and metal. You really won't need this option if your are firing ceramics. The last thing you need to think about is size. Small kiln will run through regular outlet. If you buy a bigger kiln you will need to have a designated outlet for it. You will most likely have to have more power running to o that outlet also. As for brands. I own four kilns all different brands. I can't say I like one more than the other. I do love my digital controllers more than the cone sitter kilns but that's because they just make things so much easier.